Buchenwald - the most famous concentration camp created by the Nazis during the Third Reich, through which during the Second world war were about 250 000 people. Every one of his prisoners for life remember the inscription on the gates of this horrible place. So what was written on the entrance to the hell of Buchenwald? 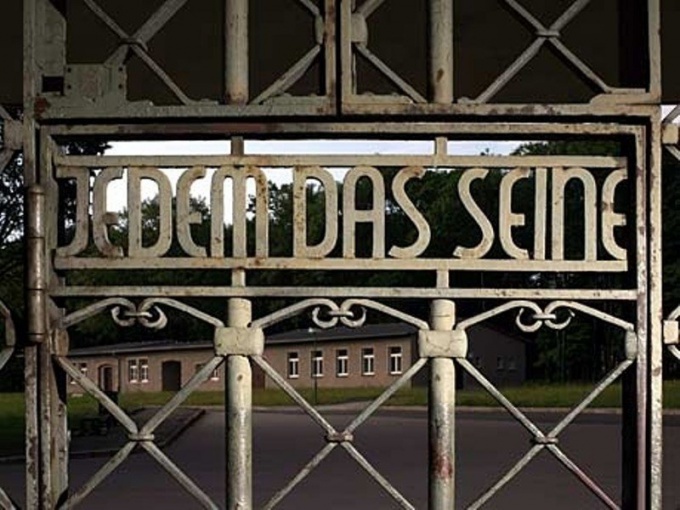 On the gates of Buchenwald, the Nazis wrote "Jedem das Seine" - a phrase translated into German from the Latin "suum cuique". In literal translation it means "to each his own" - this statement was used in Ancient Greece, where it is a classic principle of justice. The Germans interpreted it in their own way, taking the words of the seventh commandment of the Catholic catechism that says "Gönn jedem das seine" - "Submit to each his own". Today, this phrase negatively perceived in modern Germany and other countries affected by the Nazis, who associate the statement with the Third Reich. In fact, the Germans turned "Jedem das Seine" in a typical propaganda slogan of those times, making him the likeness of another of his slogan "Arbeit macht frei" (translated as "Work liberates"). This is a mocking statement hung above the entrance to Nazi camps such as Auschwitz, gross-Rosen, Dachau, Theresienstadt and Sachsenhausen. Also the Nazis used the Latin version of the phrase, making it the motto of the order "Black eagle", which was established by Frederick, and the motto of the German military police. The expression "to Each his own" or "suum cuique" has become known for its ancient Roman philosopher, orator and politician Cicero, who used it in his treatises "On the limits of good and evil," "On duties" and "About laws". Later this catch phrase came to be used not only in a legal context. Today it is the motto of Windhoek – capital of Namibia. In 1998, the company Nokia has used the saying "Jedem das Seine" in his German campaign is a mobile phone that has caused the big public resonance. In Germany the phrase "Jedem das Seine" as banned Nazi symbols associated with a call for mass murder. Also this phrase repeatedly tried to use for their advertising purposes, manufacturers. Thus, the company Rewe cynically used it when making the advertising of your grill, as Microsoft has mentioned "Jedem das Seine" in German is "Bürosoftware2". Do not stay aside and the Corporation of McDonalds that used the statement in the design menu for your branch in Thuringia. In connection with the frequent use of "Jedem das Seine", the German government tried to draw public attention to this problem, which is painful for the people of Germany.